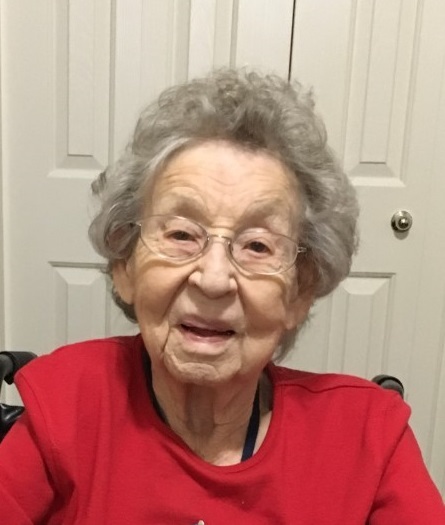 Marjorie (Grimes) Webb, 95, of Nampa and formerly of Cascade and Great Falls, Montana, passed away on Tuesday, January 29, 2019 at a local care center in Nampa, Idaho. At her request there will be no service at this time. A Graveside Service will be held in Montana at a later date and that will be announced in the Montana newspapers. Arrangements are under the direction of the Nampa Funeral Home, Yraguen Chapel, 415 12th Ave. So. – 208-442-8171. Marge was born on December 8, 1923 in Helena, Montana to Thomas Walter and Corinne Grimes. She lived her early years on the Seiben and Westwood Ranches in Cascade, Montana. She attended and graduated from Cascade Public Schools in 1942. During her high school years, she worked as a telephone operator at the local telephone exchange. Following graduation, she moved to St. Helens, Oregon to assist her sister, Helen Warehime with her growing family. In the fall of 1942 she attended St. Vincents Hospital School of Nursing in Portland, Oregon to study nursing. Due to the death of her father this opportunity was cut short and she returned to Cascade. She married Elwood Webb in December of 1942 and they lived on the Webb ranch at St. Peters Mission and Simms for 30 years. During this time she raised cattle, horses, chickens, pheasants and children. She and Elwood divorced in 1974. Marge moved to Great Falls, Montana and started a career in Insurance. She worked for Home Insurance Company in the claims department until 1986. She was awarded the insurance woman of the year in 1985 for her work she did lobbying the legislature to defeat legislation affecting the insurance industry. When her position at the insurance company ended because the company closed the Great Falls office, she trained to become a home health provider. She worked with Spectrum Health until 1999 when she retired. She was a member of the Methodist Church in Cascade and Great Falls. She spent many years at a 4-H Leader as well as a Boy and Girl Scout Leader. She was a member of the Cascade Home Demonstration Club and the Mission Bells. She belonged to the Eagles and VFW Clubs in Great Falls. She sang for many years as a member of the Sweet Adalines Choir and The Swinging Seniors. They sang at nursing homes and put on many shows and provided entertainment for the community. In 2006 she moved to Nampa, Idaho to be near some of her children. Marge is survived by her children, Elwood Webb, Jr. (Fran), Nampa, ID; Karen Johnson (Mel), Elk City, Idaho; Kathleen Barnhart, Castro Valley, CA; Kristine LeVeque, Nampa, ID; Nathaniel Webb, Husson, Montana and Kimberly Krueger (Rex), Denver, CO; 13 grandchilren and 20 great grandchildren. She was preceded in death by her parents, Walter and Corrine Grimes; 2 sisters, Alice Cobb and Helen Warehime; a brother, Thomas Grimes and 2 children, Norman and Samuel Webb. The family would like to thank the staff at Heron Place Assisted Living in Nampa, ID and the staff at Horizon Hospice in Nampa, ID for their love and care for Marge in her last days and a special thanks goes to Dakota with Horizon Hospice.